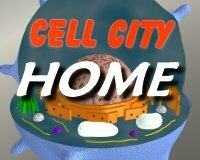 At the centre of the cell lies the nucleus. It is at the same time the command centre, the planning department and the central library - roughly equivalent to City Hall. Inside the nucleus lie the chromosomes that carry the genetic instructions. They are a sort of master plan that specifies how the cell should develop. It would many millions of such files to write down all the instructions for even one cell, so a special code is used, based on very long chain molecules of DNA - deoxyribonucleic acid. 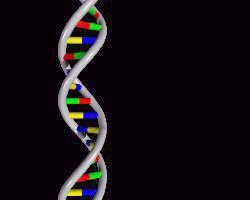 A DNA molecule is rather like a necklace of two entwined strands. On each strand are strung four different kinds of beads, which are called bases. It is the sequence of these bases that makes up the genetic code. The DNA molecules are organized into units or libraries called chromosomes. 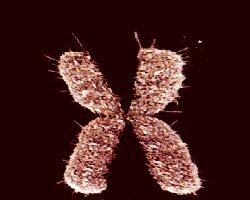 When viewed under a microscope these chromosomes take on a characteristic cross shape - they are the "X-Files" of the cell! For the information in the DNA to be used by the cell, portions of it first have to be copied. Short single stranded copies of one of the two DNA strands in the nucleus are made. These copies represent detailed messages that can be transported out of the nucleus, through special holes or pores, into the rest of the cell. Each message is like a bar-code, only longer, and each contains the information to manufacture a protein.